Hubby just came into the living room where I am sitting on the couch with my laptop writing this blog and asked me if I was going to start my blog similar to how Barbara Stanwyck did in the old film, Christmas in Connecticut, began her column with a cozy description of domestic life. He suggested something like this...Here I sit in my pajamas on the couch with cats on my lap happily typing away to the tune of a rainy drizzle while my husband is in the kitchen making plump, golden pancakes. I kinda like it, thanks Hubby, especially since it leads to a nice transition where I can introduce the two books I will write about today, Nothing to Do but Stay by Carrie Young and Neal Thompson's A Curious Man: The Strange and Brilliant Life of Robert "Believe it or not" Ripley At first thought, I didn't know how I could tie all this together, but it actually is quite easy. Carrie Young's memoir includes wonderful scenes of domestic life heavily involving cooking (ie...pancakes) and A Curious Man does not. Okay, so that was lame, but seriously there is a nice strong thread of realizing your dreams in all of this. 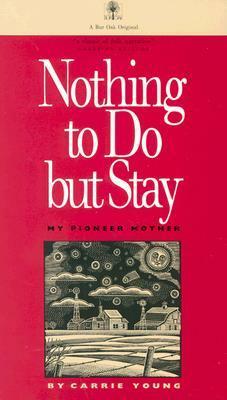 Young's mother and Ripley were both people who envisioned a better life and stuck with it until they accomplished it. Both were ambitious, hardworking and pioneers. You ask what my connection is to all this? It's simple, I'm envisioning delicious, warm gluten-free pancakes and I'm not going anywhere until I get them! Carrie Young opens her book with these lines, My pioneering mother was wild for education. She fervently believed that young people given enough schooling and using the brains they were born with could rise above themselves as far as they wanted to go, the sky the limit. She, herself, with no formal education of any kind, had managed to lead a remarkable life characterized from end to end with vision and courage. Young proceeds to chronicle how her mother lived her life with courage and vision. In spite of her peers' philosophy that high school "spoiled" their offspring and that they were better off learning to work hard and run their farms, Carrie's mother arranged for her 2 oldest daughters to attend the only accredited high school in the area even though it was 30 miles away. Even though she had no fear of bucking the traditional lifestyle of the Norwegian community, her mother garnered the community's respect. Her hard work, spotless housekeeping and delicious cooking earned her a place in everyone's heart. This was no delicate flower of a lady! Unmarried until the spinster-ish age of 34, she feared she would not be able to produce children. She birthed six. Not only did she marry and have children, but she flaunted convention by convincing her husband to abandon his land claim upon marriage and live on her land claim that she had proven which boasted better soil. Needless to say, reading about this spunky, pioneering lady proved to be entertaining. My only regret lay in the fact that the title hints at a story or hardship and perseverance to conquer the North Dakota prairie, while this memoir centers much more around personalities, food and culture - all things I love, but alas, I was primed for a tale of roughing it on the untamed prairie, costing the book one star. I heartily recommend this to readers who devour books about strong women, the Western frontier, history buffs and memoir readers in general. The life of Robert Ripley gives credence to the maxim that anyone can attain whatever they want with hard work. Although, not a handsome man, Ripley knew how to hold an audience's attention. His determination to break into the newspaper market began at a young age. When the local paper wouldn't hire him, he went to the big city where after much difficulty he landed a job. From that point, Ripley weathered ups and downs, at times losing almost everything he had gained. Although I never found myself enamored with the man himself or his interests, I thought the story of his life inspirational, well-written and worth reading. The narration of the audiobook I listened to passed muster. I recommend this book to non-fiction readers in need of an entertaining excursion from more serious reading.